Built under an ISO9001-2008 Quality Assurance Program, Greenheck industrial dampers offer heavy-duty options for air control, shut-off, balancing and isolation for higher pressures, temperatures and airflows than commercial grade dampers. 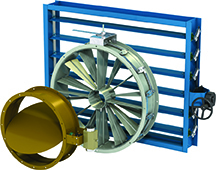 Ideal for nuclear, tunnel, bio lab, and power generation applications, Greenheck’s complete line of industrial dampers includes control, backdraft and pressure relief, UL rated smoke, tunnel transit, blast, tornado, and bubble tight dampers. Greenheck, the worldwide leader in manufacturing and distributing air movement and control equipment, offers the most UL certified dampers and the largest selection of AMCA licensed dampers in the industry.